Call me picky but to my mind a hot drink should be just that – HOT! If a travel mug suggests that your beverage of choice will remain steaming to the last drop then that’s exactly what I expect. But we all know that these promises are seldom met. Hydro Flask has been something of a revelation. Yes, it really does work! It’s a rather stylish slim and contemporary metal bottle and just about as far from the tartan cup-lidded flasks of old as one could get. 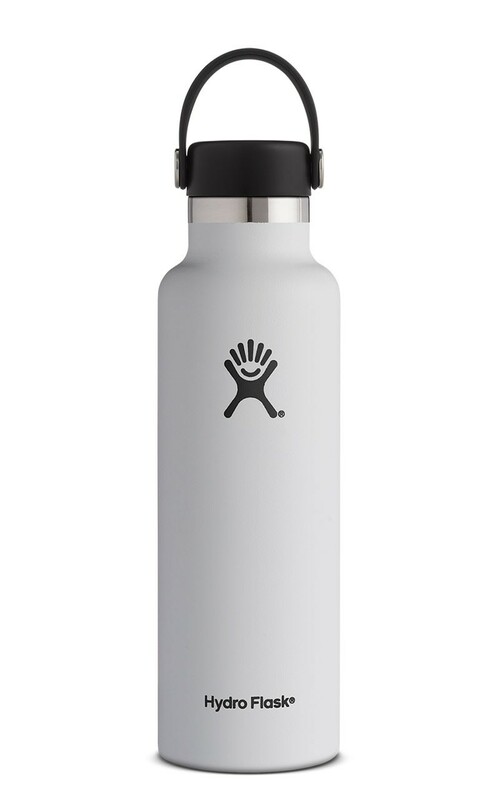 The outside of the Hydro Flask remains cool to the touch, the screw top is convenient, chunky and safe and it’s replaceable. Strong and made with stainless steel pivots and an easy-to-carry strap, this has insulation to help keep those drinks hot for up to 12 hours or cold for up to 24 hours. This company offers a range of quality products for outdoor enthusiasts, and for the rest of us who get sweaty palms if we see a tree but spend our waking hours commuting or sitting at a desk. It’s important to drink enough, but at the perfect temperature. The great advantage of this flask is that the lid is totally secure with no worries about sip clips slipping! One can decant a cup’s-worth into a lidded mug that might not have such great thermal qualities, and top that up with still-hot drink as the hours go by. That makes this a welcome gift especially for those who own a less well-insulated travel mug. I am impressed. For sporty types, there is even a Sport Cap version for keeping water chilled when out sporting. My Hydro Flask is in cool white, but it is available in a host of other colours to suit every fashion-victim’s wardrobe. It constitutes a great gift that will be loved by commuters, the desk-bound, joggers, hikers and even Summer Sunday picnickers. I am a convert.